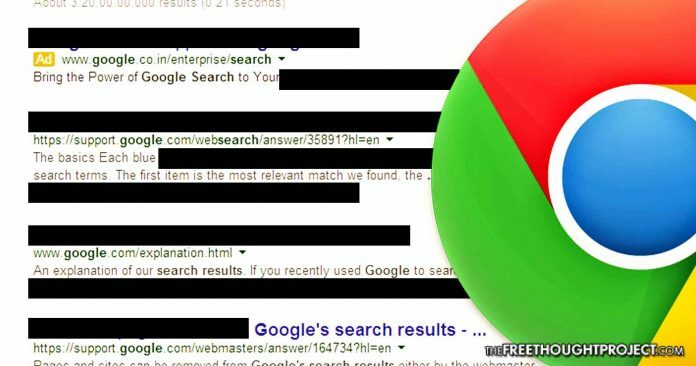 Leaked documents now reveal a plan by search engine behemoth Google to censor alternative media through the blatant suppression of search results — and, for all intents and purposes, the censoring appears part of the political establishment’s plan to quash dissent. 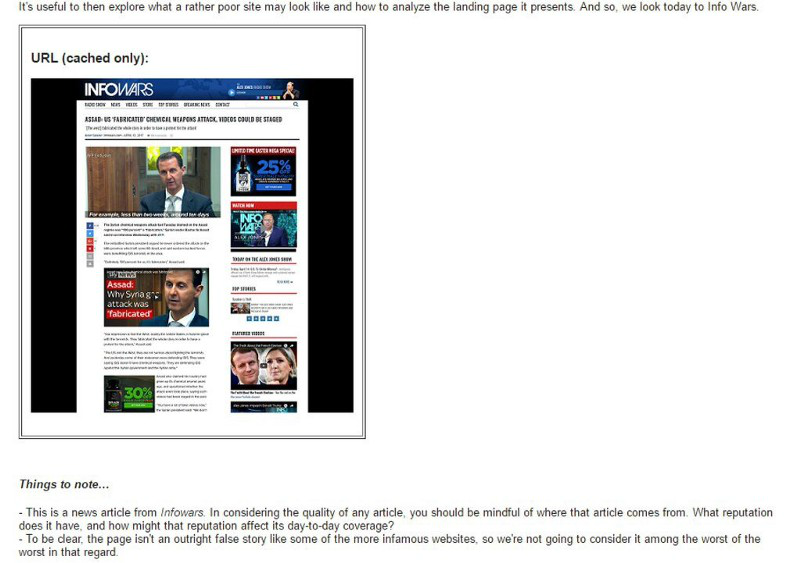 “A Google representative appeared to confirm the validity of Cernovich’s report, linking Business Insider to his Medium post. “A vendor hired by Google employs contractors to rate the websites that appear in its search results — the rating is used to improve search quality, helping Google’s automated search algorithm prioritize higher-rated, reliable information. While Google does employ contractors that way to improve an automated algorithm, the company noted to Business Insider it had not given instructions citing specific websites to use as examples in quality ratings; rather, it provides general guidelines for improving searches. InfoWars, which has been skewered for publishing articles both leaning alt-right and of the conspiracy variety, was understandably infuriated over the behind-the-scenes — if, perhaps, technically unintentional — method of censorship by suppression. On Monday’s Alex Jones show, Cernovich enjoined followers to protest the startling censorship of InfoWars by protesting peacefully outside Google’s headquarters. Just over one month ago, Google announced its answer to improving the quality of searches by battling faulty information and disreputable sites with a veritable army of contractors rating items to place trusted news sites at the top. However, like Facebook, or Twitter, or YouTube, what Google fails to mention about pushing ‘low quality’ sites to the bottom rung, is the punishing effect it takes on the flow of the free press — and the potential to snuff silent a growing body of independent media reporting largely unbiased, legitimate news items. In fact, InfoWars might be the perfect example of why selective, subjective suppression allows the State and private companies to censor information painting the U.S. in an unfavorable light — or, worse, dissenting opinion, entirely. This isn’t to say false reports, disinformation, and so-called ‘click bait’ contribute anything of value to the world of 24/7 news — indeed, Alex Jones’ InfoWars has a reputation for publishing items of highly questionable accuracy. “Jones’ assertion that upwards of 25% of Muslims have gone on record and said they want to ‘conduct violent attacks’ against the US and Europe is supported by zero evidence. In fact, Infowars published an article Wednesday, linking to the actual data which proves them wrong. “In a blatant attempt to strike fear into the hearts of their xenophobic reader base, (who used to be antiwar and pro freedom of religion) Jones shills once again for Trump by pointing out that 21% of Syrians polled have favorable views ISIS. What Infowars conveniently left out, however, is the fact that the country with the highest levels of support for Isis outside Syria showed only 14 percent of people having a favorable view of the group. InfoWars certainly lurched hard right in time for Trump’s presidential campaign — and has published false reports like the aforementioned — but the website has not completely forsaken truth for entertainment. 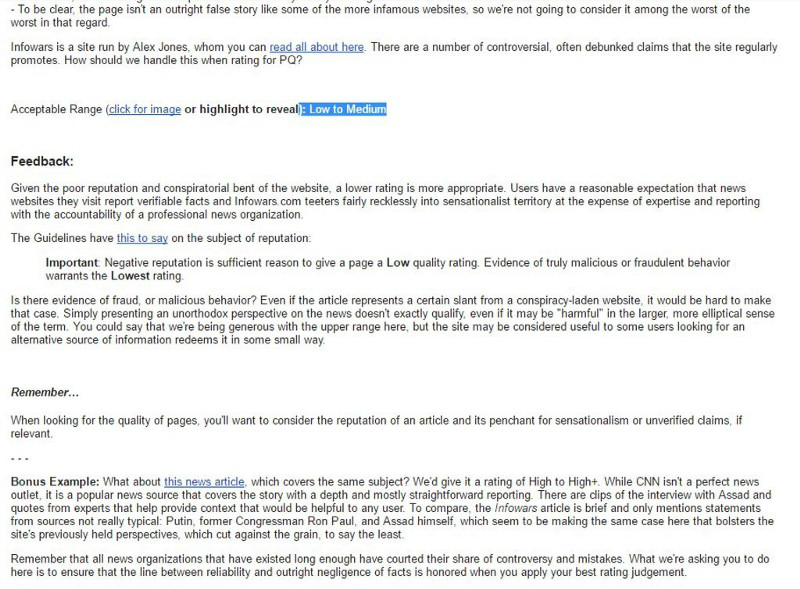 Although propagating demonstrably false information should undoubtedly give pause about the quality of a website calling itself a reporter of real news, every news organization in existence has likely published and retracted articles later proven to be inaccurate — and those who don’t face loss in readership and revenue. Notably, a number of weaponized fake reports most often aligning with the U.S. Government’s agendas — published by the Washington Post, New York Times, and many others — have not garnered those once-illustrious news hawks the same suppression as InfoWars and other outlets not in lock step with the mainstream narrative. Google claims the quality search training document listing InfoWars as unreliable was a mistake — yet the ridiculously thin effort to slay dissent under the cover of combating so-called fake news has thus far focused on independent media, which, for example, might criticize the need for war. No matter from which sources you prefer to glean the news, that preference must remain your option if there is to be any legitimate semblance of freedom in this nation — after all, it is the free press who are supposed to serve as government watchdogs to rein in any uncontrolled usurpation of power.